Wildlife officer Greg O'Neill searches the Mary River a gigantic confirmed 4.5m croc and it's smaller buddy. THE search continues today for two crocodiles in the Mary River, one a gigantic 4.5m, lurking unusually further south than their normal habitat. An Environment and Heritage Department spokesman says wildlife officers are continuing their efforts but it may take some time as the crocodiles are wary of people and human-related objects, such as traps. They say one of the reasons the crocs are so far south could be they do not yet have their "own" range and are searching to establish their own territory. 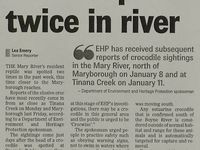 "Members of the public can greatly assist EHP's efforts to capture the crocodiles by avoiding the area of Grahams Creek if possible," the spokesman said. "We'd also like to remind people that it is dangerous to interfere with floating traps, regardless of whether there is a crocodile within. "Estuarine crocodiles are highly mobile and are capable of traveling long distances, with some animals known to cover more than 40km in a single day. "Crocodiles that do not have a home range or territory will keep moving, sometimes more than 600km, in their attempt to establish one. 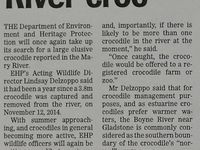 "Estuarine crocodiles in the Mary River are automatically targeted for capture and removal as they are south of the Boyne River, near Gladstone, which is deemed to be the southern end of the animals' normal range and habitat.  Remember, you are responsible for your own safety in croc country. Warning signs had been put in place and a floating trap deployed near Grahams Creek, EHP southern wildlife manager Sally Egan said. 'Wildlife officers are continuing to conduct vessel-based surveys of the Mary River,' she added. Fraser Coast Regional Council Deputy Mayor George Seymour told Skynews this week croc sightings in the area were unusual but not unprecedented. 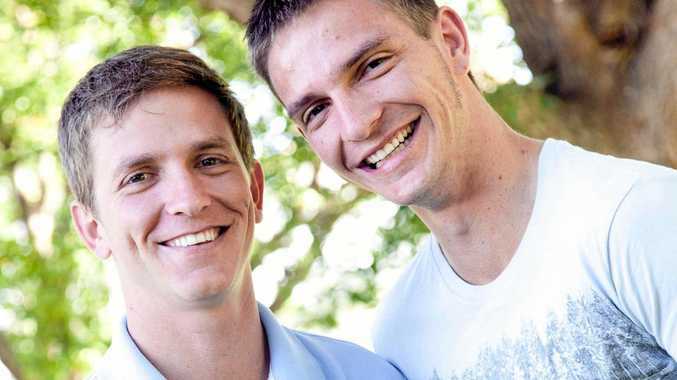 'It's very unusual for there to be two,' he said. Mr Seymour said residents in the area may not be well-versed in how to remain safe around crocodiles and urged parents, dog owners and boaties to remain alert. It was unusual to find estuarine crocodiles so far south, an EHP spokeswoman said. Once an animal ventures south of the Boyne River, near Gladstone, they are automatically targeted for relocation because that is considered the southern end of their normal habitat. Two crocodiles have been removed from the Mary River in the past three years. 'One of the difficulties in removing these crocodiles is that they are not exhibiting any aggressive or concerning behaviour,' the spokeswoman told Skynews. 'They also appear to be actively avoiding people, boats and built-up areas. 'The area where the pair has been spotted is mostly an agricultural region outside Maryborough. "The river is used by both commercial and recreational fishers"
AUSTRALIA is home to two species of crocodile, the freshwater crocodile which is found nowhere else in the world, and the estuarine crocodile. Both species can live in fresh or salt water. Freshwater crocodiles live in the inland waterways of northern Australia. In Queensland, they are found in the rivers and swamps of Cape York Peninsula, areas bordering the Gulf of Carpentaria and the north-west. East coast populations exist in the upper Herbert River, the Burdekin River catchment and the Ross River. Freshwater crocodiles also live in tidal reaches of some rivers. Estuarine crocodiles are found in India, throughout South-East Asia and New Guinea, in northern Australia, Vanuatu and the Solomon Islands. In Queensland, they are known to live between Gladstone and Cape York Peninsula, and throughout the Gulf of Carpentaria. Although most commonly seen in tidal reaches of rivers, they also live in freshwater lagoons, rivers, and swamps hundreds of kilometres inland from the coast. They can even be found along beaches and around offshore islands in the Great Barrier Reef and Torres Strait. Crocodiles use the water, sun and shade to maintain their preferred body temperature of 30-33°C. When basking, they orientate their bodies to ensure the maximum surface area is exposed to the sun. Crocodiles cannot sweat. To avoid over-heating they may return to the water or lie with their jaws agape, allowing cool air to circulate over the skin in their mouths. This process of heating and cooling their bodies is called thermoregulation and is crucial for many bodily functions including digestion and movement. Crocodiles are one of the few reptiles to have a four-chambered heart (like mammals). They can also stay underwater for extended time because they can slow their heart rate, allowing them to hold their breath for longer. However, they cannot maintain strenuous activity for long periods and can easily become exhausted while capturing prey or fighting other crocodiles. Extreme exertion is done anaerobically (without oxygen) and must be followed by a period of rest so that the 'oxygen debt' can be repaid to their muscles. The result of anaerobic activity is a build-up of lactic acid in the blood. Although crocodiles can withstand higher levels of blood acidity than other animals, sometimes it can be fatal. Crocodiles can see underwater due to a transparent lid that closes over their eye to protect it. They also have excellent night vision, due to a specialised retina, as well as a good sense of smell. Small sensory buds around the top and bottom jaws allow crocodiles to detect vibrations-crucial when hunting in murky water. Crocodiles are opportunistic feeders that eat a variety of animals. Their jaws have immense crushing power, enabling them to easily break through skulls and other bones. Prey is not chewed but swallowed as large chunks. If the chunks are too big to swallow whole, the crocodile may roll several times or shake its head in an attempt to break off a smaller piece. Although their stomach secretions are highly acidic, they cannot digest some items, such as fur, hooves and turtle shells. These items collect in the stomach and may either be passed through undigested or turned into 'hairballs' and regurgitated later. Studies have shown that crocodiles can convert as much as 50-70% of their food into growth and energy. By contrast, humans use only 3-4%-up to 80% of our food is used to produce heat and maintain a constant body temperature. This efficiency in crocodiles means that they can go for months without eating. Commercially, crocodiles are now an important resource. Farmed crocodile meat is a gourmet item on many menus around the world, and their skins are recognised as a durable leather that is made into a variety of products. Crocodiles are also a major tourist attraction throughout northern Australia, both in the wild and in wildlife sanctuaries. 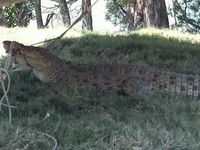 You can see both species of crocodiles at the David Fleay Wildlife Park on the Gold Coast ( http://www.npsr.qld.gov.au/parks/david-fleay/index.html ). Habitat destruction is now considered a major threat to crocodile survival in Queensland. Increasingly, humans are crowding crocodile territory-developments in swamps, mangroves and rivers are displacing crocodiles from their homes. While thousands of crocodiles are killed in other countries for their skins, Australia's 2 crocodile species are protected in the wild. This means that it is illegal to interfere with these animals, which includes removing eggs, and possessing or taking crocodile parts (such as skulls and skins) without a licence. In North and Central Queensland, and in the Mary River, yellow warning signs are placed at access points to waterways where estuarine crocodiles may live. Be aware, estuarine crocodiles may be present, even if there are no warning signs. Although estuarine crocodile attacks on humans are recorded, statistics show that you are more likely to die from a lightning strike or bee sting than from a crocodile attack. Australia is one of the very few places in the world where estuarine crocodiles have a good chance of survival in the wild, and the only country where the freshwater crocodile is found. Because crocodiles are an important part of the food chain and help keep our wetland environments healthy and stable, protecting them is critical. This means you have a responsibility to conserve and manage our crocodile populations. 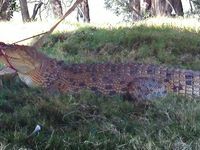 Wildlife rangers from the Department of Environment and Heritage Protection (EHP) captured a 3.1 metre crocodile in the Mary River near Maryborough. The crocodile was first spotted in July 2013 along with another larger 3.5 metre crocodile. These crocodiles had been listed as crocodiles of concern by EHP and targeted for removal from the wild. Traps previously set by wildlife rangers had not been successful in capturing the crocodiles. Early on Thursday 7 November 2013, wildlife rangers were able to capture one of the crocodiles using a non-lethal harpoon and remove it from the water. 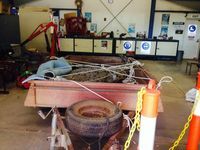 The crocodile was transported to a crocodile farm in Rockhampton in central Queensland. EHP has a coordinated set of crocodile management policies in place. Under these policies, crocodiles captured south of the Boyne River will be relocated to a crocodile farm or zoo. 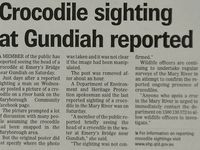 Crocodile sightings can be reported to EHP at any time on 1300 130 372.